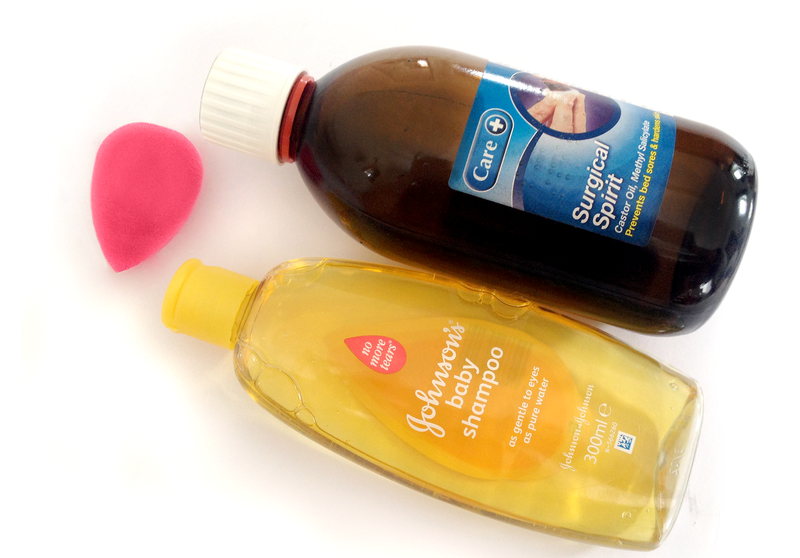 A super quick post today as after a few years of cursing my beauty sponges when they got dirty, I've worked out the quickest and easiest way to clean them, and wanted to share it! I'm a real stickler for getting my sponges scrupulously clean- I wash every last remnant of foundation/concealer from the surface and make sure the inside is as spotless as it can be too. Spending so long under the hot tap means it has taken about a year for any of my sponges to develop a stain, but it also means that I dread sponge-cleaning time as it takes so long. I asked for suggestions for a better method than just Baby Shampoo and antibacterial cleanser a while ago on twitter and I received all sorts of suggestions from showering with sponges to putting them in the washing machine, but nothing worked well enough for me. I wrote about Surgical Spirit in my recent favourites post, and raved about how well it cleans and sanitises brushes and how cheap it is for a huge bottle (£3.56 for 500ml at my local chemist, or £1.35 for 200ml at Superdrug). I've been the loving the Beauty Blender since I received one in the July Birchbox but unfortunately I accidentally threw away the soap it came with and, looking for a way to keep my washing woes to a minimum, I turned to the Surgical Spirit to see what it could do. My new method is to place the sponge in an old or disposable plastic cup, then pour the Surgical Spirit over it until it swells, before giving it a few squeezes and pokes in the cup. It's amazing how dirty the liquid turns! As Surgical Spirit is mainly alcohol, it will kill any germs and bacteria lurking on and inside the sponge. After squishing the sponge in the cup for a bit, I pour away the Spirit and squeeze the sponge tightly in sink, it already looks considerable cleaner. I then move onto Baby Shampoo, and it takes two lots of shampooing and rinsing instead of the usual million to get the sponge completely stain-free, alcohol free, and back to its original clean state. I find the best way to lather it up is to rub the shampoo onto the outside of the sponge then roll it in between the palms of my hands instead of trying to scrub or squeeze the gel in. I then leave it in a little dish to air dry until I'm ready to use it. I usually find dye comes out of a new sponge for the first 5 or so washes, and the Spirit seems to really draw this extra dye out, which I find helpful as it can stain my sink during normal sponge washing. It does lightens the sponge's colour a little bit on the first wash so if colour is very important to you then this may not be the right method. However the alcohol doesn't change the texture or usage of the sponge at all and the shortened cleaning time outweighs a bit of colour change for me. If you're struggling to keep your sponges spotless and sanitised I would highly recommend getting yourself a bottle of Surgical Spirit, as it not only works brilliantly on sponges but it's also great for brushes too!